I am always intrigued by the history of wine and those who make it. 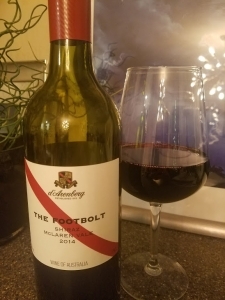 The story of this week’s wine, an Australian Shiraz called The Footbolt, is the name; to what, exactly, does Footbolt refer? First, a little history. Winemaking in Australia started in the late 1800s, and spread from there. Today, there are 12 families that are known as Australia’s First Families of Wine, and D’Arenberg is one. The story of Footbolt starts at the beginning of the Osborn family’s venture into winemaking. Joseph Osborn was a successful racehorse owner, with several prize-winning horses. His son, Francis, was studying medicine, but was in ill health. Doctors advised Francis to give up his studies and “take up life on the land,” so he persuaded his father to purchase the D’Arenberg property in the McLaren Vale. To make this happen, Joseph made the tough decision sell all his horses, including Footbolt, the pride of his stable. The Footbolt was named after this prize-winning racehorse, which made winemaking possible for the Osborn family. The Footbolt Shiraz has a lot going on. Pull the cork and you’ll notice distinctive black pepper and baking spice aromas with a hint of licorice. Rich boysenberry and blackberry flavors are balanced with ripe tannins which carries through to a long, spicy, mineral finish. This is a really interesting wine, not your typical Australian Shiraz, and I found myself thinking about this bottle after it was gone. On my five-cork scale based on taste and value, The Footbolt Shiraz from D’Arenberg Winery gets 3.75 corks. It’s normally a $20 wine, but you can find it at The Party Source for about $15 right now. If you’d like to try interesting wines like this, please join me at our next private wine party at The Party Source! I host a wine dinner there every month with sommelier and wine manager Steve Tartaglia, and we feature several interesting wines, paired with a delicious catered dinner from Kate’s Catering and Personal Chef Services. There are always cool prizes to win, too, so listen Wednesday at 4:15 to win your spot on the guest list, or click here for a chance to win!